International arbitration is governed by a cornerstone principle, the principle of consent. This means that parties are free to include, by mutual consent, an arbitration agreement in their contract. By the same token, they can organize such arbitration proceedings by choosing either an ad hoc arbitration or an arbitration administered by an institution. Nonetheless, the ability to reach an agreement has limits, particularly once an arbitration has commenced. This usually happens at the stage of the appointment of arbitrators, especially when the parties are in disagreement regarding the chair of the arbitral tribunal. In this respect, when the parties choose an administered arbitration, the arbitration rules of a given arbitral institution usually apply by default. However, difficulties may arise when an arbitration agreement provides for ad hoc arbitration without any specification concerning the rules to respect of appointing an arbitral tribunal. In such cases, parties can reach out to an arbitral institution that would either act as appointing authority, or designate such an appointing authority, or often request the intervention of State courts. In the following paragraphs, we will discuss the particularities of an arbitration institution which often serves as appointing authority, the International Chamber of Commerce (“ICC”). 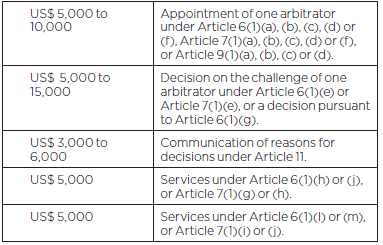 The 2018 Rules of the ICC as an appointing authority in UNCITRAL or other arbitration proceedings (the “2018 ICC Rules”) have been in force since 1 January 2018. The 2018 ICC Rules set forth a series of provisions permitting “the International Chamber of Commerce or any authority within ICC” to act as an appointing authority either in UNCITRAL Arbitration Proceedings or other arbitration proceedings (ad hoc or administered by other arbitral institutions). In addition to serving as appointing authority, the ICC can provide further administrative services in order to facilitate UNCITRAL and Non-UNCITRAL ad hoc arbitration proceedings. g) perform any other services on which the parties may have agreed. When requesting ICC to act under the Rules, a party shall submit an application (the “Application”) to the Secretariat at any of its offices pursuant to the Internal Rules. The Secretariat shall notify the other party or parties, and any arbitrators, if applicable, of the receipt of the Application and the date of such receipt. The date on which the Application is received by the Secretariat shall, for all purposes, be deemed to be the date on which ICC is requested to act under the Rules. k) any other information that the Applicant deems appropriate. In accordance with Article 12(1) of the 2018 ICC Rules and Article 1 of their Appendix, “each Application shall be accompanied by a non-refundable filing fee” amounting to USD 5,000.00. The 2018 ICC Rules envisage two methods of pricing for the above-mentioned services (Article 2 of the Appendix): either as a fixed fee for each service provided separately, or as a single fixed fee for multiple services. Article 4 of the Appendix provides that, should the Parties opt for a single, fixed fee for multiple services, its amount shall be greater, equal to a range of between USD 90,000.00 and USD 150,000.00. Article 12(2) of the 2018 ICC Rules provides that “after the receipt of the Application, the Secretary General shall fix an advance on costs”. The International Chamber of Commerce (‘ICC’) shall act as appointing authority in accordance with the Rules of ICC as Appointing Authority in UNCITRAL or Other Arbitration Proceedings. D. Gaukrodger, “Appointing Authorities and the Selection of Arbitrators In investor-State Dispute Settlement: An Overview”, OECD Consultation Paper, March 2018, p. 18, ¶ 41. Article 1.1 of the 2018 ICC Rules.Also, for the purposes of the 2018 ICC Rules, Authority within ICC includes “inter alia, the Chairman and Secretary General of ICC, the President and Secretary General of the Court, and ICC National Committees and Groups”, Article 2(v). For the purposes of the 2018 ICC Rules, UNCITRAL Arbitration Proceedings are defined as “ad hoc arbitration proceedings conducted under the UNCITRAL Arbitration Rules”, Article 2(i). For the purposes of the 2018 ICC Rules, Other Institutional Arbitration Proceedings are defined as “arbitration proceedings conducted under the rules of an institution other than ICC”, Article 2(iii).